Only about 30 percent of Queen’s engineering graduates go on to become working professional engineers. Most of the rest take advantage of the broad range of other options open to engineering graduates. Take Dalton Kellett, Sc ’15, for example. He has followed a path to become a top-level race car driver. Kellett has raced his entire adult life. He started in karts at 14 at Goodwood Kartways in Stouffville, Ontario. Some of the biggest names in Canadian auto racing – Paul Tracy, James Hinchcliffe, Robert Wickens, Ron Fellows – got their starts there, too. Kellett wanted to join them and he knew the most likely path to the winner’s circle included a strong education balanced with more racing experience. So, he kept racing while he pursued his undergraduate degree in Engineering Physics here at Queen’s. While balancing studies in Engineering Physics and a budding career in racing, Kellett was a member of Queen’s Formula SAE Design and Race Team, serving as lead designer and one of the team managers. In years as an undergrad, Kellett competed successfully for Pabst Racing Services in the USF2000 racing series in 2012 and 2013 before moving to ProMazda with Team Pelfrey later in 2013 and through 2014. 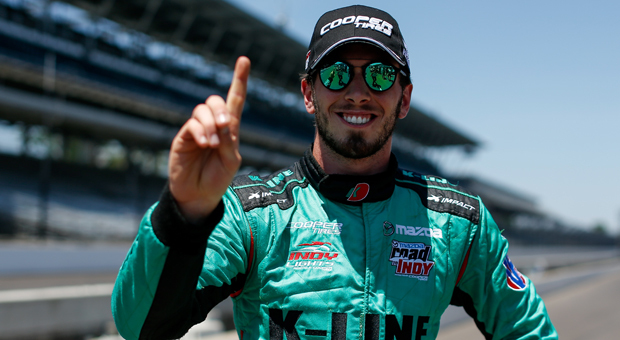 He returned to ProMazda in 2015, this time with Andretti Autosport. He also made time to participate as a member of Queen’s Formula SAE Design and Race Team. After graduating from Queen’s, Kellett has continued to race with Andretti Autosport, moving up to the Indy Light Series in 2016. So far in 2018, he is ranked an impressive 7th overall in the series with three podium finishes. “I drank a lot of coffee in The Tea Room but I think my engineering education gave me a lot of valuable skills in terms of time management and understanding the amount of work you can take on and still actually push through,” says Kellett. “Once I graduated from Queen’s, I decided that, as an athlete, I have a platform that I can put to good use supporting STEM initiatives. It’s what I’m passionate about and it’s an area where I can contribute given my experience and background. Kellett is partnered with Ten80 Education, a Portland-based STEM charity, as the brand spokesperson for its National STEM League. It’s a remote-control racing car league for primary and secondary school students. Participants gain practical experience designing, building, and racing their own cars. Kellett also continues, when he can, to lend his help to Queen’s Formula SAE as a mentor and as a valuable alumni contact in top-level racing. “We’re trying to plan a camp visit with some of the engineers, have them come down and learn some stuff from some of the IndyCar guys, maybe do some simulator training,” he says. Kellett is a brand spokesperson for Ten80 Education’s National STEM League, an RC racing league for primary and secondary school students. Written by Andrew Hardman & Matt Mills. Photos by IMS Productions. Story as it originally appeared on the Engineering & Applied Science website.